How is it that a technology designed for particle size reduction is also ideally suited for gently rupturing cells? Particle size reduction is all about breaking particles apart. 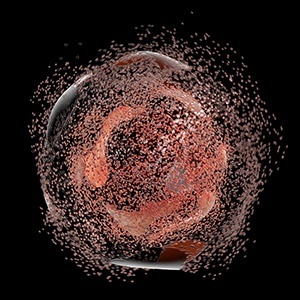 Cell disruption is the first step for breaking cells apart, releasing desired biomolecules from within the cell. Different cell types require different types of forces in order to be properly lysed. For example, yeast has a hard cell wall that can be difficult to break open. For this application increasing the force of impact tends to improve results. However if applying these same mixing forces to E.Coli, the cell would be destroyed entirely. Which is why we are able to custom tailor the emulsifying cell to increase shear instead, leading to better results for this unique cell type. This is why the ability to custom tailor each mixing force is critical to achieving industry leading results in such a wide range of different cell disruption applications. Process Flexibility - Different cells and biological materials require different cell disruption processes such as gentle and harsher methods. 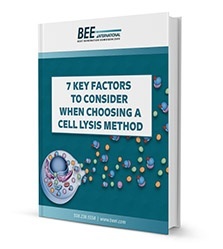 The ideal method can adjust the process to handle a wide variety of cells. BEE International’s technology means you can control the process to make it suit the product. As the name implies, high shear mixers use the mechanical force of shear to rupture cells while sonic cavitation is used by other instruments. BEE technology is an in-line process which makes use of cavitation, shear and impact. More importantly, it allows the developer to adjust these forces to be more gentle or harsh to produce different effects. In this way the optimum results for high yield cell rupture are achieved for the widest variety of cells.